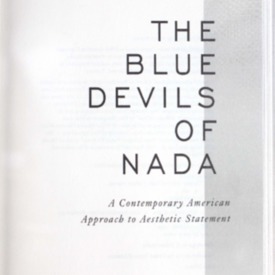 The blue devils of Nada : a contemporary American approach to aesthetic statement · One Book. One Author. One Hour. Notes on front endpaper: Andre Malraux. Underlinings/Notes: Underlinings: American literature/writers, southern roots, Duke Ellington biography strong. Biographies/autobiographies of US blacks seem to promote political program. Lamb underlines information on other biographies and Murray's reaction to them. Somerset Maugham on autobiography, black experience, Ralph Bunche, political significance/details, Hemingway. Notes: Angry," "Sony tape, 6 years," "Mister Bateman," "Rousseau, Franklin, Douglass, Adams," "bored," "Louis Armstrong," "all politics," "Malraux," "RWE v. Louis Armstrong." Murray, Albert, “The blue devils of Nada : a contemporary American approach to aesthetic statement,” One Book. One Author. One Hour., accessed April 19, 2019, http://booknotes.gmu.edu/items/show/339.